The fact that the richest 1% of the world owns more than half of the world’s wealth is making a lot of people upset. Mark Goldring, Oxfam UK’s chief executive said: “This is the latest evidence that extreme inequality is out of control.”. But is inequality really a problem? In his book ”The Great Escape” Angus Deaton, the Nobel prize winner in Economy 2015, argues that inequality generally is the result of progress. He makes a comparison with smoking. The knowledge about the dangers of smoking has saved millions of lives during the past 50 years, but the educated were faster to react and quit smoking. This created a “health gap” between the educated and the less educated who were slower to adjust to the new knowledge. Angus means that the same applies to wealth and that inequality is not a problem, as long as everyone is getting wealthier over time. One of the key reasons why many are upset about the super rich, is the misconception that there is a fixed amount of wealth in the world and that wealth therefore has to be distributed evenly. New wealth is created all the time – thanks to the continuous advancements of technology, which enables us to get more value out of every work hour spent, while also using less resources. The total value (GDP) generated each year has grown enormously ever since the industrial revolution started – and especially during the past 50 years – as you can see in the graph below. Globalization and Capitalism are the key drivers behind the growth in global wealth. They are also the best tools available for erasing extreme poverty. In 1990 37% of the world’s population was extremely poor and lived on less than $1.90 per day, according to the World Bank. 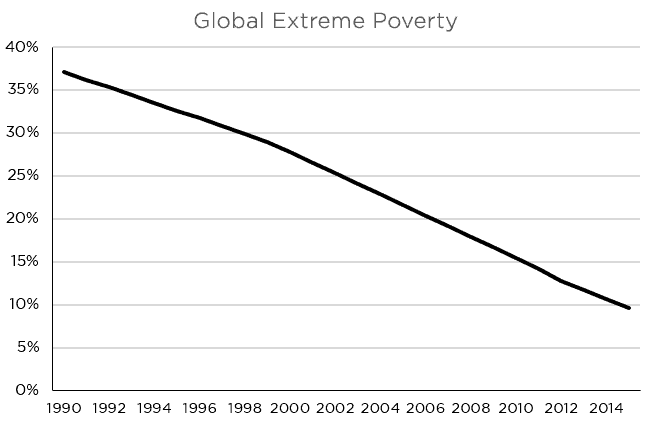 Now in 2015, the portion of extreme poverty has declined to less than 10% of the world’s population. This means that 138,000 people have left extreme poverty behind – every day during the past 25 years – and that humanity now is in a better shape than ever – thanks to Capitalism and Globalization. One key hindering factor for growth is the lack of good governments and institutions. Many of the countries with slower growth have problems with kleptocracy (where the political leaders enrich themselves) such as many African countries and Russia. Many slow growth countries also have weak institutions, causing the “contract” between the state and the citizen to be broken. Citizens don’t pay taxes and the state does not provide any dependable services and structures. So if you are truly eager to help the extremely poor in the world, you should probably spend less time complaining about the rich and stop talking about redistribution of wealth, and instead spend more time advocating for Globalization, Capitalism and Entrepreneurship.